Dr. Yung specializes in the care of older adults with arthritis. His research focuses on understanding the relationship between age-related changes in the immune system and the development of chronic inflammatory diseases in the elderly. His research has been continuously funded by the National Institute of Health (NIH) since 1992. Dr. Yung is the recipient of a number of national awards including the American College of Rheumatology (ACR) Senior Rheumatology Scholar Award (1995) and the Paul Beeson Physician Faculty Scholars in Aging Research Award (1998). 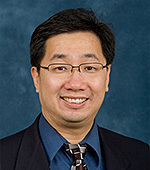 He has consistently been named among America’s “Top Doctors.” Dr. Yung is an active member of a number of national societies including the American College of Rheumatology (Committee on Education, Annual Meeting Planning Committee, the ACR-NIH Relations Subcommittee, Patient Education Task Force) and the Association of Specialty Professors (T. Franklin Williams Scholars Program, Geriatrics Steering Committee). Dr. Yung served as the director of the Musculoskeletal Sequence Course for the University of Michigan Medical School from 2002 to 2007. Dr. Yung received his medical training at the University of Liverpool, England. After completing his Internal Medicine residency in Detroit, he received fellowship training in Rheumatology and Geriatric Medicine, both at the University of Michigan.